I feel like you're so much more than just my boyfriend. You're the one person I need to talk to when I've had a bad day, the one person I can rely on not to judge me. You're my rock, my sweetheart, my best friend. 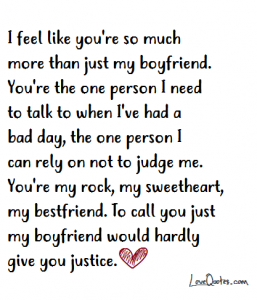 To call you just my boyfriend would hardly give you justice.